The city of West Palm Beach is a perfect representation of Florida living with its white, sandy beaches, turquoise waves, palm trees and sunny skies. It is a travel destination that literally millions of people visit every year in hopes to get a little taste of what it feels like to live like a local. However, any real Floridian knows that West Palm Beach doesn’t always feel like an endless summer. The tropical climate can create brutal hurricanes that affect millions of home and business owners every year. The impact of these severe weather patterns was most recently felt when Hurricane Irma hit 2017. The storm created 15-foot storm surges that caused 65% of the homes in Florida to become flooded by up to 10 feet of water in some area. The aftermath of a hurricane such as Irma can be overwhelming, to say the least, and having a support system to get you through a flooding crisis is crucial to a successful recovery. When any degree of flooding is present in a structure it creates water damage that needs to be repaired by a professional restoration company. 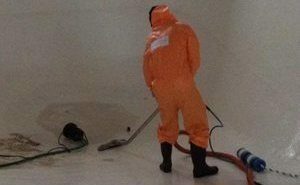 It is understandable that it is tempting to try to start the cleanup effort on your own, but there are several reasons why it would be in your best interest to turn to professionals to extract the water and dry the premises. If a flood affects your commercial or residential property it is necessary to get that water out of your property as fast as you can in order to prevent permanent structural damage. A restoration company will use powerful sump pumps and wet vacuums that can remove gallons upon gallons of water quickly and efficiently. Not only do you need the water extracted at a rapid rate, but the property then needs to be thoroughly dried out. It is crucial to remove every trace of moisture, otherwise, mold and mildew may begin to infest the property. This can happen quicker than you may imagine, especially in the hot, humid climate of West Palm Beach. 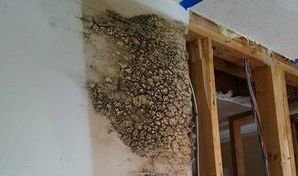 Within 24 hours previously dormant mold spores can begin to flourish, eating away at your property and creating health hazards. A restoration company will use air movers, dehumidifiers, and air purifiers to get your property as dry as possible. Not only that, but the technicians can then check the home or business for signs of mold when they are finished removing the moisture, just to be safe. Staying safe during the aftermath of a flood needs to be a priority, and along with mold, the water itself can pose some serious health risks. Floodwater is considered to be a category 3 water, which means it contains hazardous material, such as bacteria, human and animal waste, carcasses and other toxins that can make you ill upon contact. Experts will wear protective gear when conducting the remediation work, ensuring that the job is done in the safest possible manner. You will also most likely have a significant sign amount of debris in and around your property that can be difficult to manage on your own. A professional restoration company will help you determine which items can be salvaged and which things are too water damaged to keep. If your favorite couch was completely drenched by floodwater, then you may need an expert’s opinion to convince you that it’s just not worth the risk to save it. Getting the best possible care for your home or business after it has been affected by a flood is the right choice. It may seem expensive, but if you have the proper insurance, then the remediation work should be covered. It will also save you the hassle of dealing with issues later on down the line that were not properly dealt with directly after the flood. 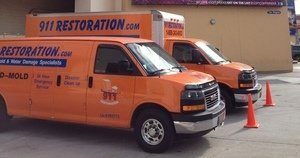 So, call 911 Restoration West Palm Beach the next time you need emergency water damage remediation services and we will make sure you get the help you need to completely bounce back after a flood.